sweet and tasty natural raspberry & wild strawberry flavor. 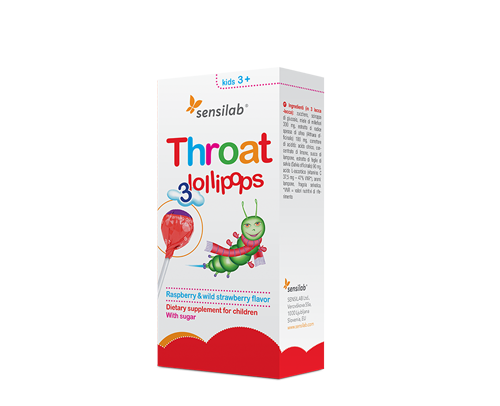 Throat lollipops are innovative form of dietary supplement that children will love. Throat Lollipops contain vitamin C, which contributes to the functioning of the immune system and reduces tiredness and fatigue. They also contain marshmallow root, which contributes to antibacterial activity, and sage leaf, which soothes a dry and tickly cough. Sage also contributes to natural body defenses and has a soothing effect on the throat, pharynx and vocal cords. Suitable for children from age 3 and above. Active ingredients in 1 lollipop: multifloral bee honey 100 mg, marshmallow root extract 60 mg, sage leaf extract 30 mg, vitamin C 12.5 mg - 47% NRV.